These donut holes are not hard to make thanks to store-bought biscuit dough. Pour oil into pan deep enough for frying. Turn stove to medium heat. Divide each precut biscuit dough into thirds. Take one-third piece and flatten dough. 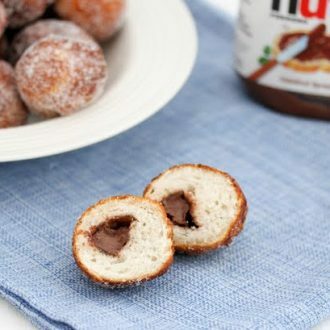 Put a 1/2 tsp of Nutella in the middle. Fold up dough, seal and roll into a ball. Gently place into fryer. Fry for about 2-3 minutes, turning over so that all sides are a golden brown. Repeat with remaining dough. After donuts have cooled, roll in bowl of sugar before serving.